Centre d'Études en Fabrication Additive / 3D, fusion laser sur lit de poudre métallique. S1-S2 : ¿x? hours (M. Vives, M. Barrabes, F. Trey, G. Mazenc) : presentation of the ALM (mainly metallic), among the metallic processes. Vocabulary (standard NF EN ISO / ASTM 52900, 2017). General limitation of the ALM processes (dimensions of the pieces, precisions, surface states, mechanical resistance). Order of magnitude of costs. Typical manufacturing steps (STL file, positioning, orientation, support, slicing, lasing, powder removing, sanding, stress relieving, separation, polishing / machining). Examples of typical applications (dental, medical / implantology, space, aeronautics). Relevant criteria for choosing such a technology: medical application (tailor-made), high value-added parts (i.e. already very expensive at first, because very complex), functions integration (eg. replace 10 parts by one), adding new features (eg. internal cooling channels), minimal weight required.=> Expected Competencies : Use this basic information to evaluate whether a part is a priori relevant for additive manufacturing or not (i.e. selection by size (but this criterion evolves), then cost, then opportunity to add / integrate function, or significantly gain mass when it’s an important issue). 2h: Presentation / comparison technologies (polymer and metal) and main limitations. 2h: Industrial speaker (T. Batigne, Lynxter®): technical and economic issues. 4h: Conception using Inspire® (each student chooses his subject of study, designs his piece, proposes a material-process pair, proposes optimal orientation and support for the manufacture, but also the post-treatment, specifies the quality expected and the cost ). 2h: Presentation of the problems of slicing and manufacturing. 4h TD: In-depth design with Inspire®, i.e. with definition of different levels of material density (to integrate lattices), a subject freely chosen by each 1 or 2 student(s). 4h tutorials: CAD (Catia) with integration of lattices. 4h TD: F.E. modelization (Abaqus) of a piece in homogeneous bimaterials, to model the full zones and the lattices zones, with identification of the homogenized Young modules of the lattices via a 3D F.E.M. calculation on a elementary shape. 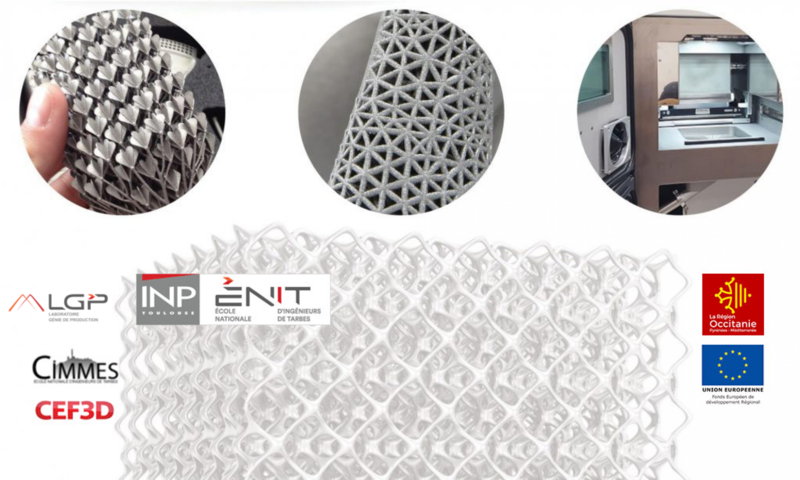 4h TP: production / analysis of printed parts with lattices (TP being developed in 2018). Use of Abaqus Tosca® on an example freely chosen by the student, with methodical study on the parameters of optimization. S11-12-13-14-15-16 : PhD Students (ex. Cousso). Additive Manufacturing of Titanium Alloys, 2016, B. Dutta,‎ F. H. Froes. Dynamics of Lattice Materials, A. S. Phani, 2017, M. I. Hussein. Lased-based additive Manufacturing of Metal Parts, 2018, L. Bian, N. Shamsaei, J.M. Usher. Thermo-Mechanical Modeling of Additive Manufacturing, 2018, M. Gouge, P. Michaleris.